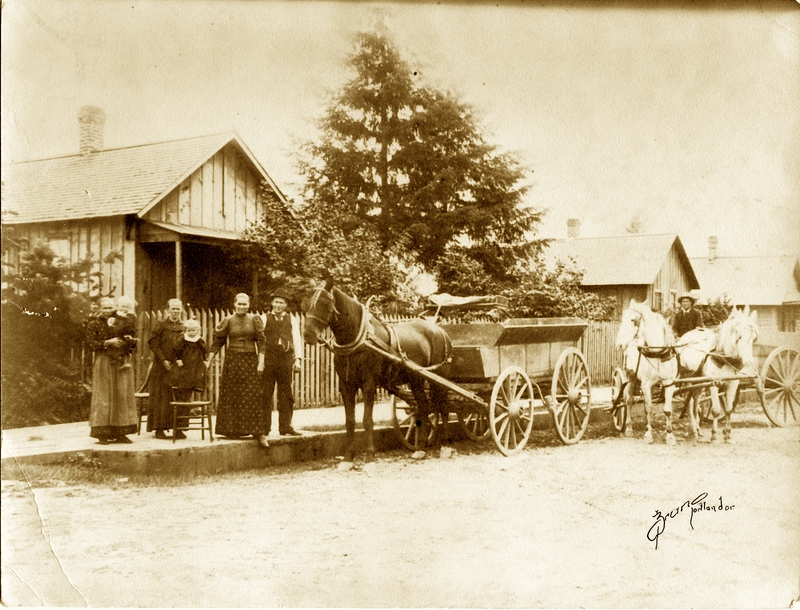 The earliest Volga German pioneers arrived in Oregon between 1881 and 1892. Some were among the very first Volga Germans to arrive in North America in 1875. These immigrants initially settled in the Midwest and within a few years decided to migrate to the Pacific Northwest. Many of the early pioneers were from the Volga German colony of Norka, Russia and shared family ties and friendships. A large group of these settlers sailed from Bremen, Germany and arrived in New York aboard the steamship EMS on June 4, 1887. Historian Emma Schwabenland Haynes describes the early Portland settlers in her unpublished manuscript titled My Mother's People. Photograph of a Volga German family in the Albina area of Portland, Oregon taken about 1905 (Bruno Art Studio was founded in Portland that year). Photograph courtesy of Stacy Hahn. "When Grandfather Miller arrived in Portland on October 27, 1890 he found about twenty Volga German families living east of the Willamette River between Tillamook and Knott Streets. Technically this area was not part of Portland, because until 1891 Albina and East Portland were incorporated as independent communities with their own mayor, town hall, banks, jail, etc. The first Volga Germans had left Kansas for Walla Walla, Washington, but after spending three months in that city, they had moved on to Portland as early as 1882. Other old timers came by boat from San Francisco or by way of Nebraska. Most of them were from the colony of Norka, and it is probably due to their influence that so many other people from that village eventually settled here. The names of the earliest pioneers include the following individuals: John Schnell, Conrad Schnell, George Betz, Ludwig Spady, Peter George, Constantin Brill, Henry Maier, Conrad Schwartz, Peter Gerloch, Adam Schwartz, Peter Wolf, Adam and David Schwindt, and a Frühauf family, all of whom had come before 1889." The follow list of pioneers was extracted from the Albina and Portland City Directories (1881-1892), the Ebenezer German Congregational Church family register, and other sources. ​Please contact us if you have additional information about the people listed below or if you have other pioneers to add to this list. The map below shows the residences of some of the earliest Volga Germans that settled in Portland and the surrounding area from 1881 to 1892. Also shown are churches, grocery stores and other historic places. ​Please contact us if you have additional information about the people listed above or if you have other pioneers to add to this list.